It has been a while since the last review was posted about a HYIP, which markets itself as a gemstone producer. Today our main topic is a HYIP called Raizex, which has joined Standard Listing on DavidNews.com 3 days ago. The program has been online for 15 days in total. Admin has positioned the project as a UK based producer of synthetic sapphire. Now I have reinvested in this program $200 and will inform you about the payment status in the next days and weeks. At least we have something different this time and I’m looking forward to finding out more about Raizex and its investment plans. Keep reading to find out more! Admin positions Raizex as a UK based company. As we all know, Londoners are proud of their city and often use its iconic symbols - Big Ben or London Bride on their websites. Of course, I have no clue if the admin of Raizex and tons of other HYIP’s with UK registered companies have anything to do with the UK. 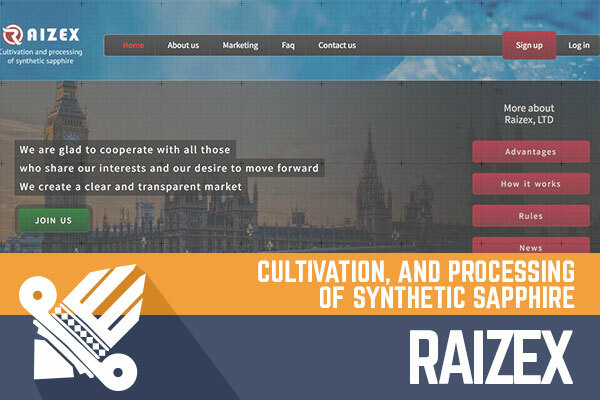 However, Raizex is not an exception – its legend is about a UK based company, it has both London Bridge and Big Ben at the top of the homepage. 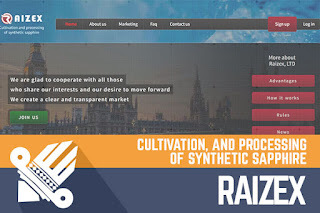 Raizex website is built on a custom-made website script and I can’t recall a HYIP websites with a similar design. In the meanwhile, I don’t see a revolutionary layout or any other unusual features on the website that would make it stand out of the crowd. The websites have a paid SSL certificate from Comodo with extended license for a year. Usually, free SSL certificate is issued for 6 months and website owner must renew it. Admin is trying to reach a broader audience on social media. Facebook and Twitter profiles look natural with 19 likes on Facebook and 0 followers on Twitter. In case you are interested in Raizex latest news, check out their social media accounts. Links to both accounts are available on the footer of the website. The minimum deposit to join Raizex is $10 and there is no maximum deposit list. Withdrawal minimum is comparably low – $0.10 and there is no fee for withdrawals. In case you are interested earning affiliate commissions, it’s possible to earn up to 7% commission. Raizex has two different investment plans – 5% for 30 calendar days and 110% after 10 days. Initial deposit is included in the payments of both investment plans. The only difference is that in the first plan you would receive a daily payment (live accruals), but in the second plan, you receive one payment at the end of the deposit term of 10 days. Let’s say we are more interested in the investment plan for 30 days with 5% daily rate while another plan has a daily rate of 1%. $200 invested in the first plan would make a revenue of $10 reaching the break-even point after 20 days of your deposit. At the end of the investment term, such deposit would generate a total profit of $100, while the same amount of money deposited in the second plan would make $20 profit after 10 days. Sure, the second plan generates less income, but you have shorter investment terms. In the meanwhile, second investment plan has already completed one investment cycle. So far everything looks fine, right? We have a typical UK inspired HYIP, which claims to be involved in the creation of synthetic sapphire and social media profiles with few followers, which seems natural for a 15-day old HYIP. I haven’t noticed any loud marketing activities yet. Otherwise, I want to remind you that all HYIP’s are highly risky and you are the only person responsible for your investments. Therefore, if you ever decide to make any investments, don’t invest more than you can afford to lose! Are you one of the early investors of the second investment plan for 10 days? Please drop a message in the chat box and share your Raizex experience with us! Investment plans: 5% daily for 30 calendar days, initial deposit included in the payments (real-time accruals). 110% after 10 days, initial deposit included in the payment.